To answer this, look at the picture on the left. Do you see the Dalmatian? If not, take another look. If you still cannot see it, scroll down to the end of this post and look at the same picture, this time with the contours connected. Then return here. The dog should now emerge from the black blobs. 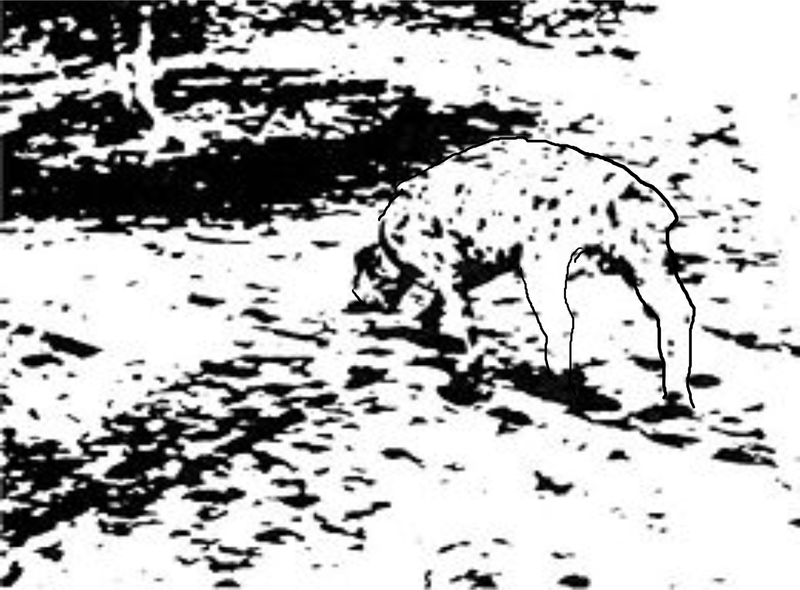 Once you “see” the Dalmatian you are confirming something that has both fascinated and puzzled scholars for a very long time, namely the human brain’s propensity to deceive its owner. Why am I saying this? For the simple reason that THERE IS NO DALMATIAN in the picture. At least not according to the normal accepted definition of a pictorial representation of an animal. The contours of the dog are illusory, which explains why some of you had to have a kick start before you could see it. So what do you see then if not an actual Dalmatian? You are in fact seeing an image that is inferred by your brain based on all its prior experiences with Dalmatians that were real. Your exposure to certain objective connections in time and space created neural pathways in your grey matter that now cause those very connections to be made when you see a mere few clues associated with them. Would anyone say that the lines in the left picture represent a bird? Surely not. Yet most people immediately see a bird in the picture on the right. Why? The lines in the two pictures are exactly the same, but in the picture on the right they are arranged in such a way that they recall the form of a bird that is stored in your mind. This is not a bird. 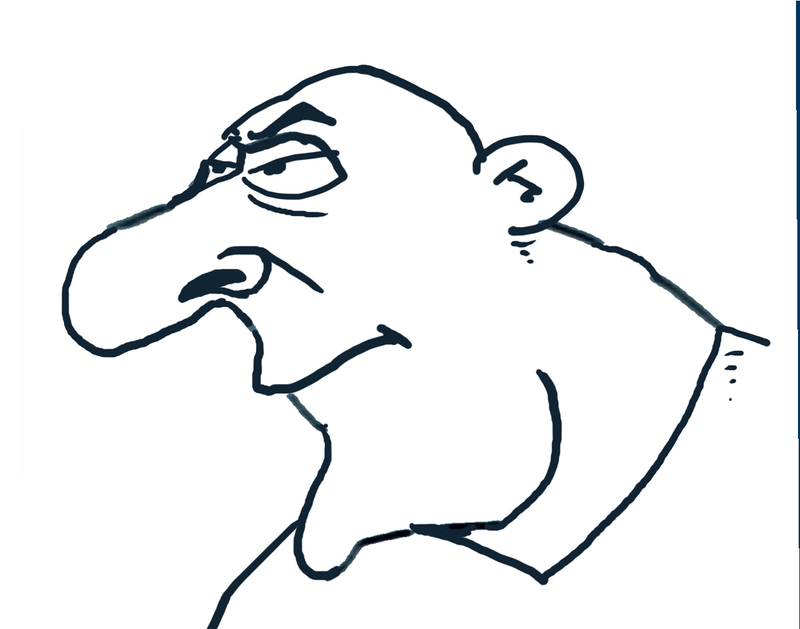 It is a face of a man, drawn on the lines of the “bird” above. By connecting them in a way that does not conform to the strong associations of a little feathered creature in our minds, a completely different picture emerges. If I were to say a moment ago that the “bird picture” represented the face of a man you would have thought that I was a bit confused. Yet I would have been no more wrong or right than those who said it was a bird. I simply chose to connect the lines according to a different association. Examples of these mind tricks abound. There is a triangle in the picture below, right? Wrong. There is no triangle. It is inferred based on a game your brain started playing when you first picked up those little red blocks in kindergarten. 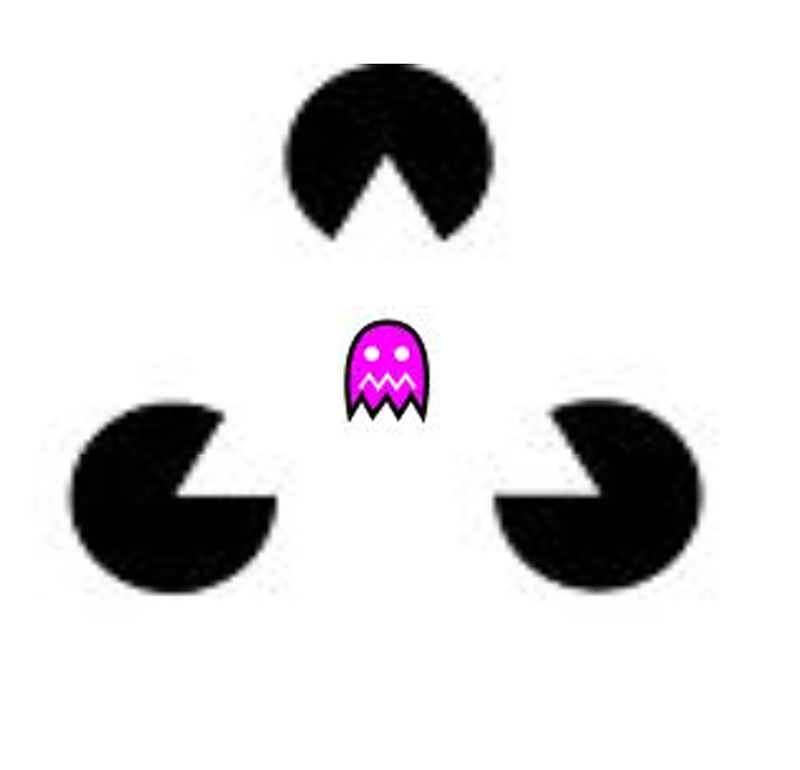 Instead of seeing a triangle I much prefer to see 3 angry Pac-Men attacking one of those little critters from the beloved eighties arcade game. Why not? It’s much more fun than a triangle that is not even there. We will get back to our elusive elephant in a moment, but before we do so, let us consider another way in which our brains employ the very mechanism above to make sense of bits-and-pieces information and turn them into cohesive wholes. You may not be aware of it, but when you recall past experiences you are also joining dots. The human memory does not retrieve an entire file associated with an event in the same way that a clerk would retrieve a law office file containing all the information associated with a case. Rather, it dips into the file and selects the highlights of the event. “Highlights” typically include the beginning of the event, the end, and any extraordinary or emotionally high-impact occurrences in between. This leaves us with the job of connecting the bits by filling in the blanks. As with the picture of the “bird” above, we tend to do so in the way that seems most obvious to us. The result is that we oftentimes reconstruct our memories according to our own biases and preferences instead of the way in which the actual events took place. We impose an “idea” of sorts on the bits of information our brains feed us, and in the process we become poor witnesses and excellent storytellers. One of the best examples of the “connection” phenomenon is the illusion of motion that is created by looking at a movie. A series of separate pictures played at a certain speed on a projector causes the stationary images to disappear and to be replaced with a lifelike rendition of the events that were filmed. Few people actually pause to think how strange this is when they watch a movie. They don’t realise that they are, in fact, witnessing a powerful demonstration of the mind’s determination to connect loose bits of information into a cohesive and sensible whole. The habit of relying on some or other “big picture” in order to make sense of the information presented to us pretty much dominates our lives, and has been noted by scholars for centuries. The line of study that is most commonly associated with these principles is known as “Gestalt theory” or “Gestalt psychology”, the German school of psychology that traces its origin to the early twentieth century and to the work of the Czech-born psychologist Max Wertheimer. Gestalt is a German word for pattern, form or shape and is employed in the English language to refer to the concept of wholeness, especially in the sense that it is used in the Gestalt motto: “The whole is more than the sum of its parts”. What distinguished the Gestalt school of psychology from its counterparts at the time was its insistence that perception is not a passive apprehension and mental storage of observable details, but an active and dynamic process of seeking some sort of order, pattern or form of which the details would only be a part. You don’t need to be a rocket scientist to see how the predominant “gestalt” or “big picture” held by your mind can actually obliterate the intended message of a single bit of information. Which finally brings us to our elephant (phew). The six men in Saxe’s poem each made the same mistake. They allowed a strong existing association to impose itself on their sensory experiences and so provide the illusion of a final understanding. Their existing insights, valid as they were, caused their exegesis to be “interrupted” and turned them into heretics. Interrupted theologians are all around us, and it is not difficult to see why. The moment the brain detects a suitable pattern from its storehouse for making sense of the bits of information presented to it, it sees no need for further exploration. Needless to say, this illusion of a final insight is the breeding ground for heresy. I may make myself unpopular here, but it is my firm conviction that Confucius’ tormentors (See previous post) all suffer from this malady. By allowing themselves the luxury of a preferred theological gestalt (a “pet doctrine” in plain English), they have shaped the entire gospel into a form that resonates deeply with them but that is in fact a caricature of the real thing.